Triton as a brand seem to ebb and flow like the tides, they come, they go and now they are back again - hopefully for good. So we thought we would take a look at one of their newest offerings, the TSPS 450 oscillating spindle sander. This machine is a tough looking cookie; not too big but heavy and very solid construction. 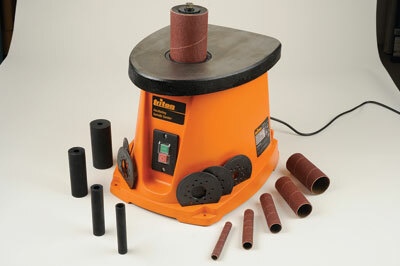 It comes with a cast iron table and the spindle takes a series of five different size diameter rubber drums. The insert recess accepts six different inserts thus ensuring there is no appreciably unsafe gap where work or fingers might otherwise get caught. Six different diameter sanding sleeves are available in a medium grade of aluminium oxide grit. The reason for five drums only, is because the smallest diameter of abrasive sleeve fits on the spindle alone without a rubber drum. To mount an abrasive, a special metal disc is dropped down the spindle. Fit the appropriate insert ring, then slide a close fitting sleeve on to its drum and slide that on to the spindle, then add the washers and tighten the nut clockwise. The action of tightening it down firmly expands the drum so the abrasive fits tightly on to it. Extraction of course is a must - handy if you can use an auto switching extractor with it. 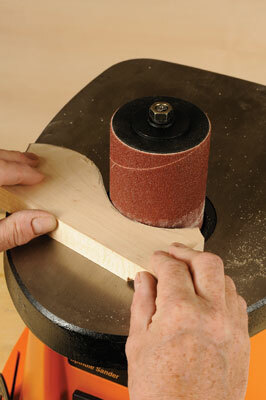 Mounting and swapping abrasives, drums and inserts is quick and easy. Unfortunately the table doesnâ€™t tilt but you could make up an angled wooden sub bed so long as it is a close fit around the drum. Extraction seems quite effective and the sanding rate is good; it didnâ€™t take me long to smooth the bandsawn edges on my test piece. In practice only the bottom end of the abrasive gets used but to get better usage simply turn the whole drum up the other way. If you have a need for sanding internal curves, this machine will do it.